Fernand Léger was a major early 20th-century Cubist, who favored colorful industrial shapes related to the mechanical age and modern urban life. 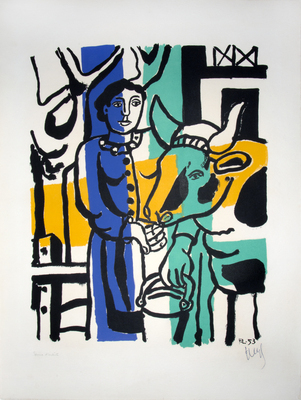 Leger’s lithograph, La Vachère, is differs from the artist’s best-known subjects due to its rural theme. Dating from the artist’s late period, it is also less abstract than are works produced during Leger’s early career.